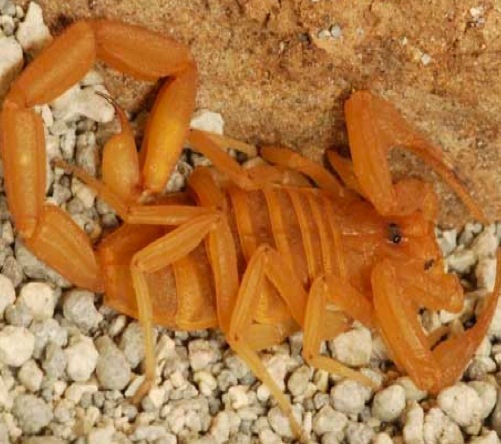 There are many scorpion species and other types of scorpions that can be classified as native arizona scorpions. One species of these is classified as potentially deadly not only in Arizona but throughout the United States. Not only that, but this desert scorpion is very common throughout the state. Color: It varies from clear, light tan, rubber band or darker golden brown. Grows naturally throughout Maricopa County and most of the state. It is commonly found inside homes and buildings where it seeks out a defined area in which to live. If a structure is on that area the number of scorpions finding their way inside can be reduced with scorpion pest control methods but can never be completely eliminated. It can cling to the underside of a piece of wood, walk across your ceiling, climb furniture, and get into clothing and cupboards. They are most active at night and seek places that are warm, dark and damp. It is the only scorpion in Maricopa County that climbs. It can climb pretty much any surface, with the exception of clean glass and clean plastic. It can curl its tail and lay it flat against its body. This allows for easy movement and the ability to squeeze itself into tiny narrow cracks. This scorpion can enter homes and buildings through a crack that is equivalent to the width of a credit card. The sting is extremely painful, but does not usually cause swelling or redness at the sting site. Victims describe the feeling as similar to having a piece of metal heated in a fire and then stabbed into the skin. The immediate local pain and burning are usually followed by numbness and tingling that travels up an arm or leg. This is a totally natural reaction to the sting. If visual disturbance, difficulty swallowing and swollen tongue sensations, slurred speech or respiratory problems occur, they should be reported to the Poison Center. Please check back with us for more scorpion facts about dangerous scorpions and other tips to help you control them.